Japanese animation studio, Ghibli has a long history with composer Hisaishi Jo. If you’re a fan of My Neighbor Totoro, or Spirited Away, you’ve heard his musical scores. 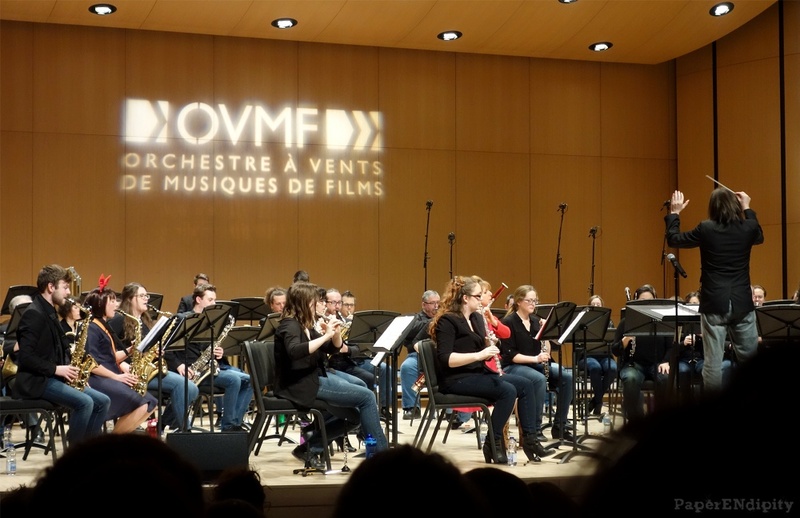 In 2017, Montreal’s OVMF (Orchestre à Vents de Musiques de Films) held several concerts of Ghibli-only music at the Salle Marguerite-Bourgeoys of the Regina-Assumpta College in Montreal. Due to popular demand, they scheduled additional performances on February 3rd and 4th, 2018. Already in existence for 17 years, the woodwinds orchestra played to a sold-out crowd once again. Musical director Jocelyn Leblanc remarked how surprised he was at the popularity of the event. But judging by the amount of Totoros dangling from spectators’ backpacks, and Princess Mononoke facepaint, it’s evident that Ghibli has a large following even outside Japan. The orchestra is made up of high-level amateurs (as they are referred to on the OVMF’s website), students and professionals, and is led by a vivacious and humorous conductor. Leblanc explained that unlike Hisaishi, he is a trombonist. Thus, he cannot switch between conducting and playing piano as the originator of these pieces does during his own orchestral performances. In consequence, the OVMF has Ahmed Soroko to fill in. The pianist has been with the orchestra since 2015. Though his style is a bit gentler than Hisaishi’s, during the first movement of Nausicaa of the Valley of the Wind (Legend of the Wind), it sounded as though Hisaishi himself was on stage. Leblanc’s arrangements keep vital parts of the original scores intact, but add unique touches, such as the ‘fluttering’ of saxophones, or the canon-like repetition of notes over notes. Though almost buried by the wall of sound, there might have also peeped a few polyrhythms (think a dissonant cross-rhythm, but less dissonant). The maestro mentioned that he and the musicians prefer performing loud and bombastic pieces. In such a way, Hisaishi’s work is a challenge for them, with its softer elements and melodic buildup. Though they succeeded in achieving the effect, there were certain areas that lacked the punch and pomp in some of the more upbeat pieces. For example, My Neighbor Totoro’s opening theme is a bit of a march. The OVMF’s take was less expressive even if well executed. That aside, crowd-pleasers from films like Laputa: Castle in the Sky, and Princess Mononoke remained true to Hisaishi’s oeuvre, even while throwing in personal touches here and there. Something interesting to note is the recent addition of a vocal ensemble. Twenty-one-year old up and coming choir director, Francis Choinière led the EVTS (Ensemble Vocal Trame Sonore). With choristers from nearly exclusively French-Canadian backgrounds, Choinière has pulled off the feat of overall smooth Japanese enunciation. To more expert ears, yes, the lyrics bear an accent, and yes, words are sung a little tentatively. But for the most part, the results are impressive, especially because the EVTS has only existed since September 2017. The purity and clarity of soloist Alice Boissinot’s soprano is reminiscent of pre-puberty boy sopranos. The choir appeared onstage for several vocal punctuations to the otherwise instrumental evening. The Legend of Ashitaka Theme (from Princess Mononoke) was a vocal high point. The orchestra and conductors wore matching blue jeans and black tops, with a Kiki (from Kiki’s Delivery Service) cosplaying saxophonist, a bright red-clad Nausicaa-esque flutist as a central focal point on the stage, and a silly full-costume Totoro who had to remove his head to sing in the choir. Those who believe classical orchestras have to be stuffy and serious would enjoy the OVMF’s more casual approach. 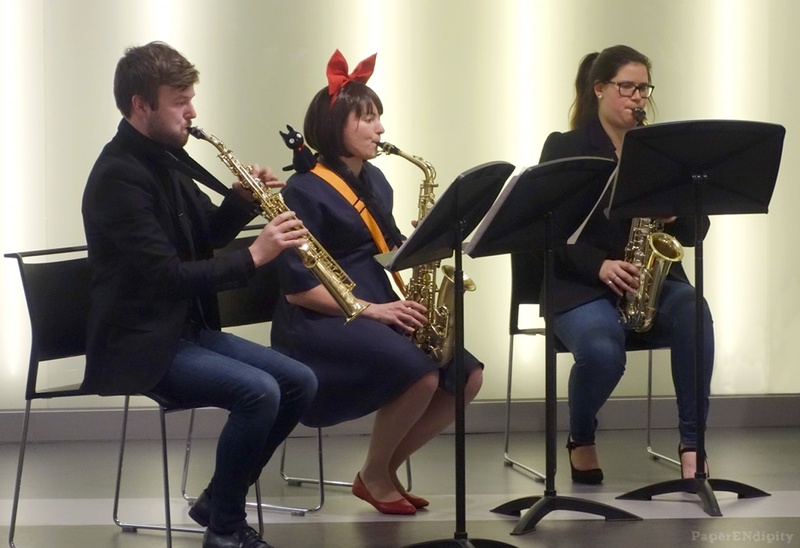 Before the official show, a saxophone sextet (including Kiki) even entertained patrons in the lobby with a little medley. The ensemble has a series of upcoming concerts featuring the music of Doctor Who, as well as Jurassic Park. Beware though – most are already selling out, so act fast!